The myth that Oregon is small and can’t hang with the “big boys” is so tired, it needs a dirt nap. Throughout the 2014 season, the Ducks stood toe-to-toe with elite teams from across the country and were nearly perfect in the win column, producing a magical year that earned them a Rose Bowl victory, a Heisman trophy winner, and a second place final national ranking. The continued growth of the Oregon football program and expanding trophy case firmly refutes any notion that the Ducks are “too soft” or “too small” to win championships. But after the national title game, the Ducks’ returning and incoming linemen are receiving more attention, and scrutiny, as fans lick their chops at the idea of another national title run. 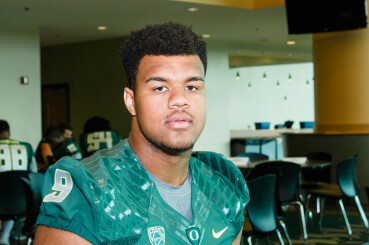 Oregon seeks to bulk up the defense after losing Arik Armstead to the 2015 NFL Draft. Indeed, during the CFB National Championship game, Oregon’s defense as a whole looked unfocused, allowing Ohio State running back Ezekiel Elliot to rush for 246 yards in a game largely controlled by the Buckeyes. But the talent, size, and strength of Oregon’s linemen was NOT the issue. Sure, the Ducks had a nightmare performance in which nearly every phase of their game appeared overmatched. 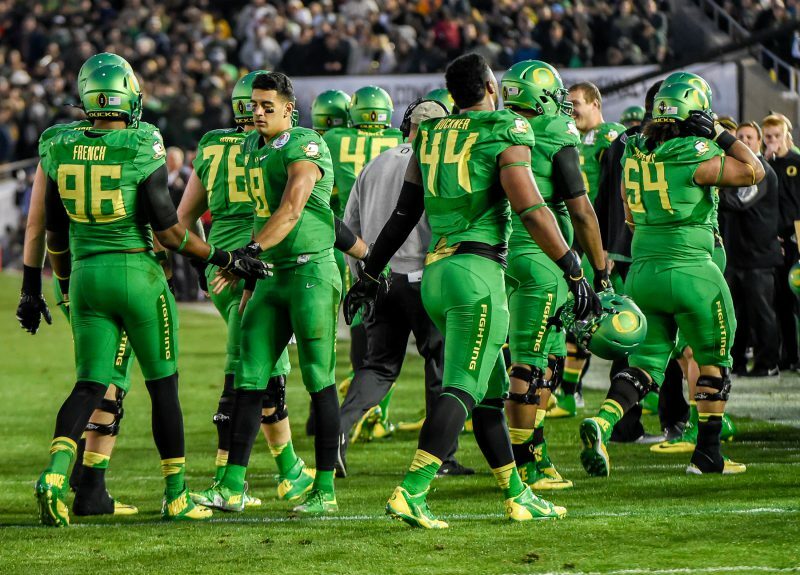 However, some things aren’t always as they appear to be, as Oregon’s defense delivered some magnificent performances in 2014. 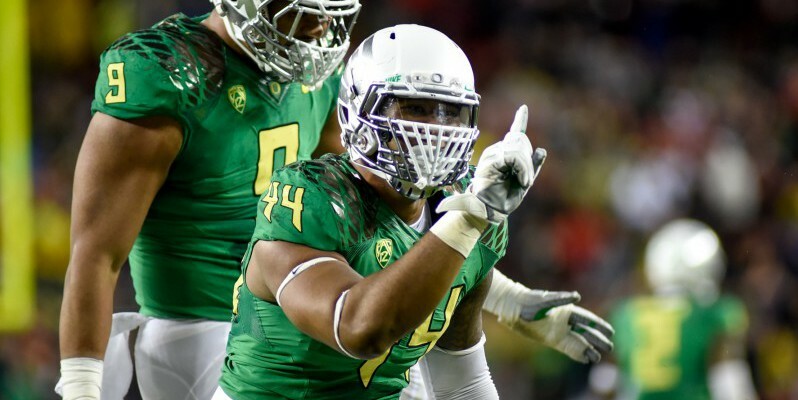 Was the national title game a bad game for Oregon? Yes. Does Oregon have small, weak, and soft players unable to compete on the highest level? No. See a doctor, because if you believe that, your brain is likely broken. So, after all the hoopla of national signing day, Oregon’s final list of 22 recruits for the 2015 season features some exciting young talent throughout the position groups, including the relatively unexpected commitment from wide receiver Kirk Merritt. The “Bayou Blur” from Louisiana is ranked as the nation’s No. 4 all-purpose prospect by 247 Sports. Importantly, Oregon Head Coach Mark Helfrich has locked in some sizable stalwarts on the defensive side of the ball. 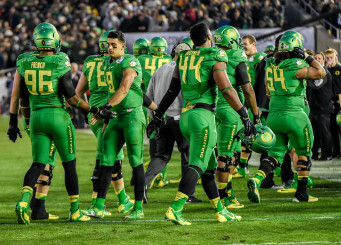 Oregon’s defense will only be stronger in 2015. Defensive Coordinator Don Pellum will build upon the return of three proven veterans on the defensive line, senior defensive end DeForest Buckner (6-foot-7, 290 pounds), senior defensive tackle Alex Balducci (6-foot-4, 310 pounds), and senior defensive end Tui Talia (6-foot-5, 285 pounds). Key backups, redshirt senior defensive tackle Sam Kamp (6-foot-4, 290 pounds) and redshirt sophomore defensive end T.J. Daniel (6-foot-6, 270 pounds), will also look to state their cases for significantly more playing time. These seasoned defensemen lay the foundation for a strong defensive unit in 2015. Pellum is beginning to develop his own cache of riches, showcasing a weapons catalogue filled with prolific players that have the potential to shine as brightly as Oregon’s offense. Such is the case with newcomers defensive end Gus Cumberlander (6-foot-6, 241 pounds) and defensive tackle Drayton Carlberg (6-foot-5, 290 pounds), two multi-purpose power-loads whose ability and versatility fit the mold of defensemen such as Arik Armstead, who has entered the 2015 NFL Draft, and will not return for another season with the Ducks. Cumberlander was rated as Georgia’s seventh-ranked in-state prospect by Scout.com and one of the top 25 weak-side defensive ends in the country by Rivals.com. Carlberg was ranked as Minnesota’s No. 2 overall in-state prospect by Scout.com, touted as one of the state’s best offensive tackles, and is among the nation’s top-27 defensive tackles by Rivals.com. Both players have shown that they are versatile athletes, a quality Helfrich and his coaching staff have consistently sought after in recruiting new players. The ability to move around and make an impact at different positions will be a huge benefit for Oregon. “The biggest thing, again, is their versatility, and I know I’ve said that too many times,” Helfrich told OregonLive. Carlberg, who was selected in the 2015 Semper Fidelis All-American Bowl, and received offers from both Ohio State and Wisconsin, said he felt a strong familial bond when visiting Oregon. “I picked Oregon because when I went on my official visit out there […], I felt that family atmosphere and that’s something I’m definitely looking forward to. And I really had a good connection with the coaches and the defensive coaches. I just felt like I was at home and that’s where I needed to be,” said Carlberg. In his senior year, Cumberlander had 27 tackles, three sacks, and two forced fumbles, helping his team finish the season as Georgia’s Class AAA Region 4A champions. And if you follow Cumberlander’s Twitter account, he is unafraid to tweet about his love for the Ducks and his commitment to Oregon football. Carlberg and Cumberlander are joined by defensive end Canton Kaumatule, a 6-foot-7, 290 pound Hawaiian brick-house who comes to Oregon rated as the fourth-best defensive end in the country and a consensus 5-star athlete, according to Scout.com. Perhaps the Ducks will never completely shake the grossly inaccurate and downright silly “soft” label. That’s fine. If you want to know the truth about Oregon football, look at the record books, alumni, current players, new recruits, coaches, and boosters. Oregon pursues and molds unique players, athletes who are more than just football robots pumped out of some manufacturing plant in southern California or recruited from a pie-eating contest on the outskirts of Steubenville, OH. “Men of Oregon” have character, pride, determination, and an unbelievable work ethic; an elite, intelligent, and dedicated band of brothers from all over the country who are committed to greatness. A for Carlberg , Cumberlander, Kaumatule and others, these mondo mallards flocked to Eugene so they could play for one of the best college football teams in the country. And each of these men hopes to leave his individual stamp in the Oregon football history books and change peoples’ dusty and largely unfounded misperceptions, one pound at a time.